Sugrim has the privilege of accomplishing many unique and diverse projects for corporate and residential clients alike, this experience enables us to serve you even better. Our team is committed to exceeding your expectations. 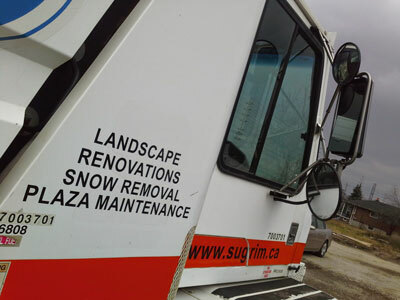 At Sugrim maintenance company, we cater to your property maintenance needs by providing Plaza Maintenance, Landscaping, Renovations and snow plowing. We are a professional company based in Mississauga, dedicated to build strong and satisfied client networks through offering quality property maintenance service. By having Sugrim; an official member of Landscape Ontario and Contractor Check, develop and maintain your business projects, you can rest assured the project will be completed in the most professional and efficient manners. Sugrim has the privilege of accomplishing many unique and diverse projects for corporate and residential clients alike, this experience enables us to serve you even better. To maintain a strong client base by ensuring that all properties in our care are clean and left in excellent condition. On August 6th, the Ministry of Health in Guyana joined with the Guyana Help the Kids, a Canadian Charity and the Toronto-based Kissoon family to open the Neo Natal Intensive Care Unit (NICU) at the West Demerara Regional Hospital. Dr. Narendra Singh, Chief of Pedriatrics at the Humber River Hospital in Toronto who was recently appointed acting Chief of Staff of this institution, is single-handedly responsible for spearheading this significant venture. It was the fourth such unit to be opened at hospitals across Guyana. A fifth unit was opened two days later at the Suddie Hospital.Each of these units is equipped with incubators, open care warmers, IV and Syringe pumps, phototherapy lamps, monitors and transport incubators along with other necessary appurtenances. The NICU unit at the Georgetown hospital also has infant ventilators and CPAP machines. Dr. Singh, president of the Guyana Help the Kids, embarked on this project about five years ago after he visited Guyana and saw the desperate need for a proper pediatric unit. Dr Singh used his influence to assemble a dynamic team of experts and specialists in the field that included internationally trained doctors, nurses and professors responsible for establishing, equipping and training the staff to get the pediatric unit operational. Dr Singh and his team are continuing to make a significant difference in the reduction of mortality rates in babies in Guyana. The locally trained staff is very committed to this project. Dr. Singh was joined on this trip by members of the Kissoon family – Mitra, Krish, Danny and Dhaman who assisted with the financing of the West Demerara Hospital unit, appropriately named after their parents Mr. Sugrim and Mrs. Latchmin Kissoon. The Kissoon family, as reported in the last edition of this paper, has been raising funds for charitable causes in Canada and around the world for the last fifteen years. 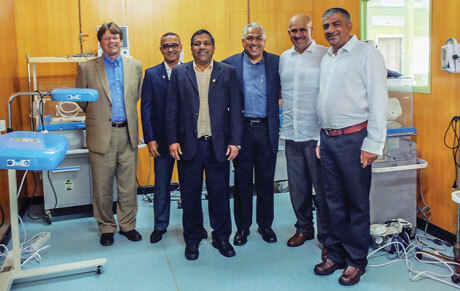 The brothers were afforded the opportunity to tour the Georgetown and West Demerara hospitals where they witnessed the pressing need for more equipment and staff. The brothers confirm that they are committed to continue their support and are in contact with Dr. Singh as to the most effective manner in which they can do so.